The summer breeze and sunny skies that stereotype Southern California easily find their way into making Huntington Beach a picture-perfect place to be. 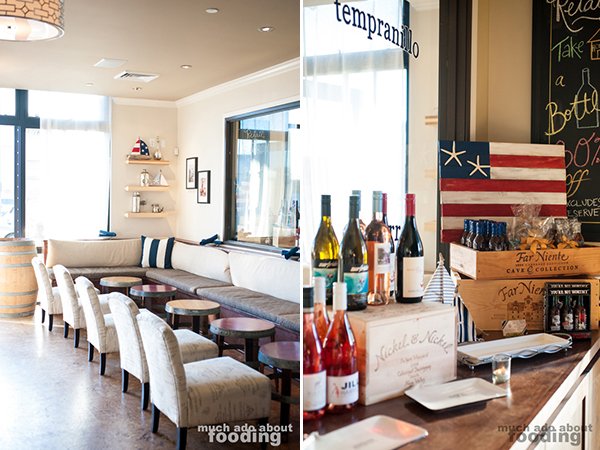 They also make it easy for SeaLegs Wine Bar in HB to become quite the destination spot for good wines and good times. I had first heard of the place last year at the Golden Foodie Awards where they managed the magnificent feast of taking home an award after only being open a few months. What an accomplishment! 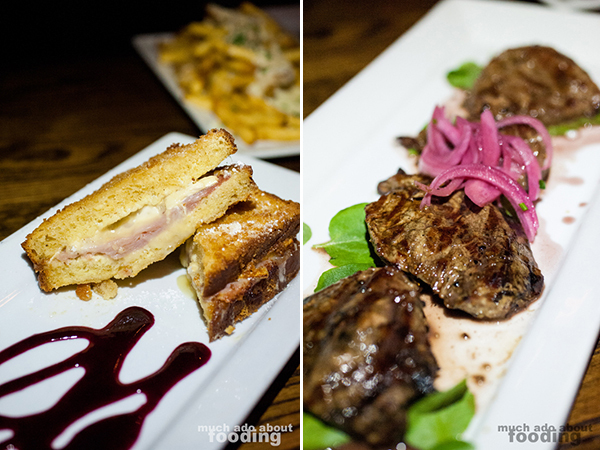 After they had just passed their one year anniversary, we were invited to a media dinner there and enjoyed a pairing menu selected by Executive Chef Alexander Dale and owners Alicia Whitney and Lisa Nonemaker. 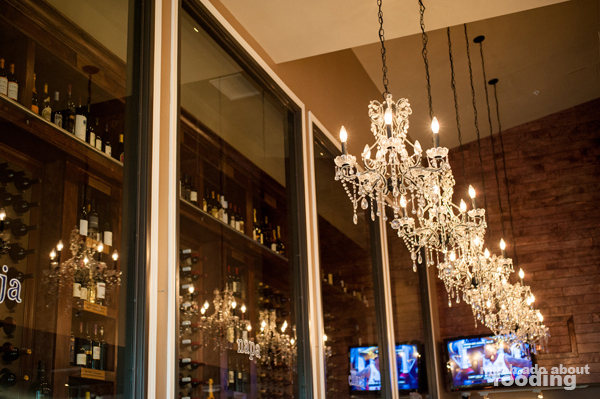 Each of the dishes chosen are also available to regular guests and craftily labeled under sections titled "Whites," "Reds," "Greens," and "Sweets" to help with your own wine pairing choices (also assisted in by the knowledgeable staff on hand). With what looked like careful consideration, the decor and design of the restaurant was chosen to follow the restaurant's nautical reference and to create an environment befitting of the HB clientele that would likely drift in. Cream and navy blue highlighted the place where wood didn't touch, and the glass windows inside sported the names of wine regions and varietals. I felt like we had walked into a deconstructed and condensed version of a ship with the lounge near the outside (a room that looked reservable for large parties) and a darker wooden bar with chandeliers in the innermost corner of the space. Of course the brilliantly large ceiling-to-floor windows also let in the blessed sunshine that gave the place a true beach feel. It was obviously well thought-out and a space that we could see many indulging in. Unfortunately for the remaining pictures in this post, the sun went down quickly after we sat down for our meal. Granted, the summertime light is still great at 7pm but given that it doesn't last too long, we only managed to snap non-flashlight shots of our first round. We started off with the White Haven Sauvignon Blanc New Zealand ($10/$36) and dishes of their Heirloom Caprese ($11 - spinach, pickled onions, and radish salad with balsamic vinaigrette on top of heirloom tomato and grilled Ricotta Solata finished with an herb oil and balsamic reduction) and Lump Crab Cakes ($16 - served with lemon tarragon aioli and micro celery). 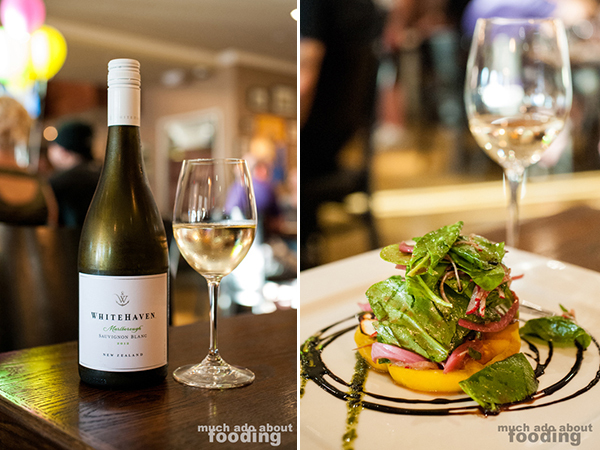 A bright and light wine, the Sauvignon Blanc went well with the light dishes which still featured bold flavors. I found the salad to be an enjoyable starter but only if you had all of the elements together in a bite; taking apart the ingredients, as sometimes happens in a stacked salad, yielded unbalanced flavors as some parts were tossed in a vinaigrette and others in a heavier reduction. All together, it was very clean and fun, especially the hard-pressed grilled ricotta which left little hints of smokiness on the tongue. 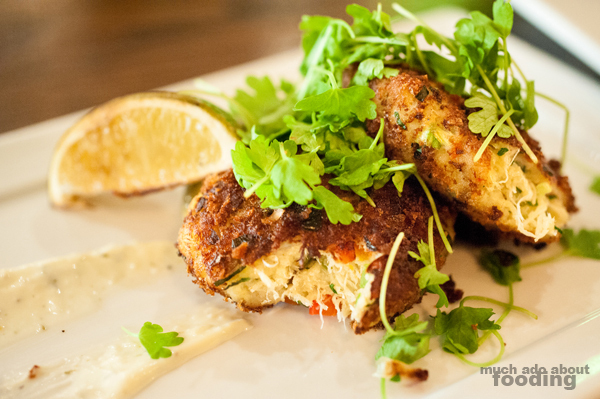 The crab cakes were fantastic when eaten with their paired aioli but perhaps lacking when standing alone. 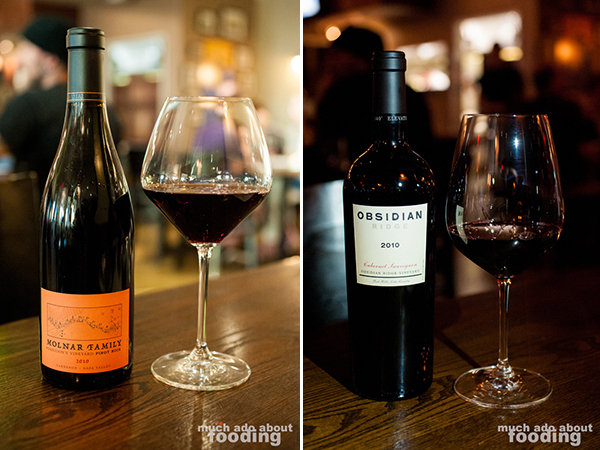 Rounds two and three were more on the savory side of the menu and gave us a chance to sip on some reds. For Round Two we had the Molnar Family Poseidon's Vineyard Pinot Noir Carneros ($15/$54) and plates of their Pig & Fig Flatbread ($13 - papaya gastrique, prosciutto, applewood smoked bacon, figs, caramelized onion, Bleu cheese, Mozzarella, and arugula on a grilled flatbread) and their Bruschetta ($10 - marinated tomato, melted Mozzarella, prosciutto, basil oil, and paprika oil on a chargrilled baguette). 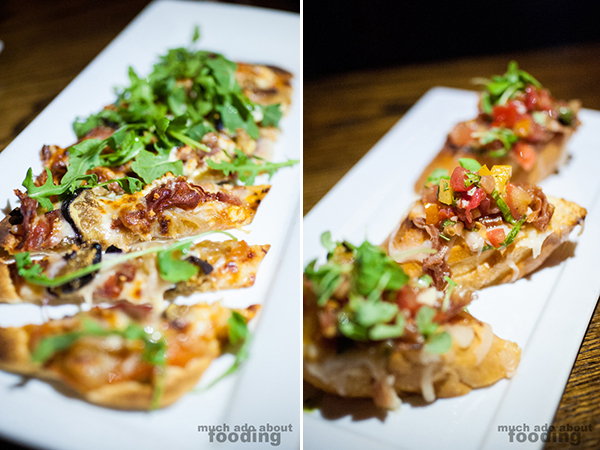 Though the two dishes shared similar ingredients, they accentuated different areas of the palate with the flatbread hitting sweet notes while the bruschetta took care of salty inclinations. I found the natural spiciness of the arugula on the flatbread a nice offset to something that could have leaned on the overly sweet side with its figs and caramelized onion. As for the bruschetta, it was just about my favorite for the night because the saltiness of the prosciutto underneath the vegetable topping took it to a whole other level. It's exactly what is missing when we crave just that "oomph" more needed from a bite of traditional bruschetta. Addictive. Round Three toppled into the heavier side of the menu. We clinked glasses together of the Obsidian Cabernet Sauvignon Lake County ($15/$50) while staring at our plates of the Monte Cristo (North country ham, melted Brie, and mustard aioli in a housemade brioche that has been deep fried and topped with powdered sugar, served with berry coulis), Charred Filet Medallions ($15 - charbroiled with pickled onions served with a red wine demiglace), and Stinky Fries ($9 - fresh cut fries with Parmesan and garlic served with a three-cheese fondue with truffle oil). The Monte Cristo was just about as over the top as you could get that night and just as messy; our fingers picked up the oil as we held the deep-fried sandwich that was a bit too much for me. Our medium rare medallions were well-seasoned on the outside but could have been a tad rarer. 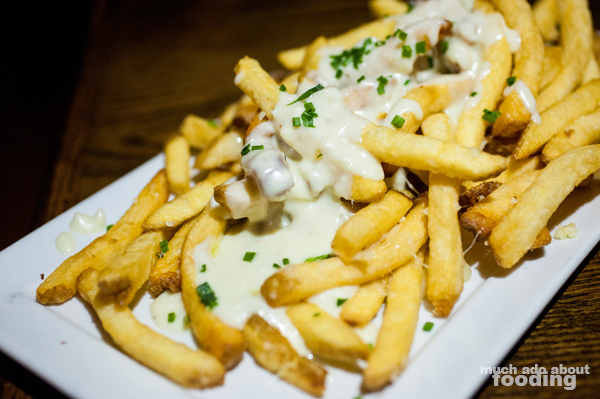 As for the fries, it is no wonder that it would be a restaurant favorite considering just how pungent the fondue was. By this point in the meal, we had just about given up on finishing any one dish so these were picked at but not swallowed up completely (more so due to our stomach capacities than any inability to sate the savory tastebuds). 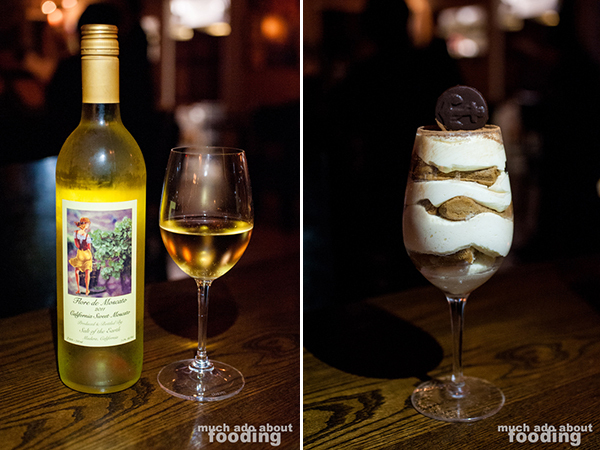 What came by to finish us off in the Dessert Round was a Salt of the Earth Muscato and the SeaLegs Tiramisu (whipped mascarpone layered in a wine glass with rum-soaked ladyfingers and topped with a chocolate anchor medallion). The wine was pleasant by itself and could have served as dessert alone! As for the tiramisu, its sheer size was daunting at first but we managed to pull through to enjoy most of it. The whipped mascarpone gave a smooth and light taste in contrast to the ladyfingers so there was a nice balance overall. Be aware though that their desserts (and their sizes!) are not for the person without enough space to finish another "entree" of sorts! 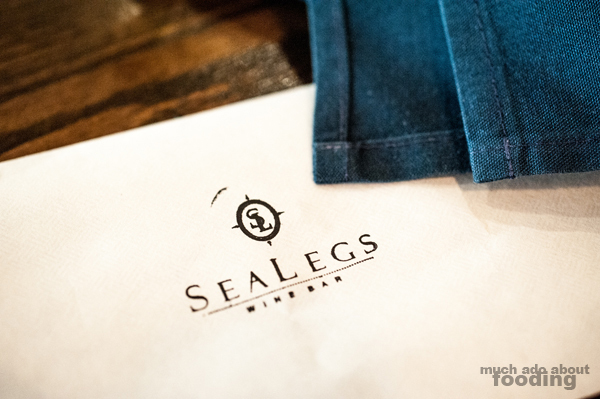 Our thanks go out to the crew over at SeaLegs for their hospitality and hard work. Congratulations on your anniversary, and here's to hoping that you'll be able to defend your title for the Golden Foodie Awards this year. 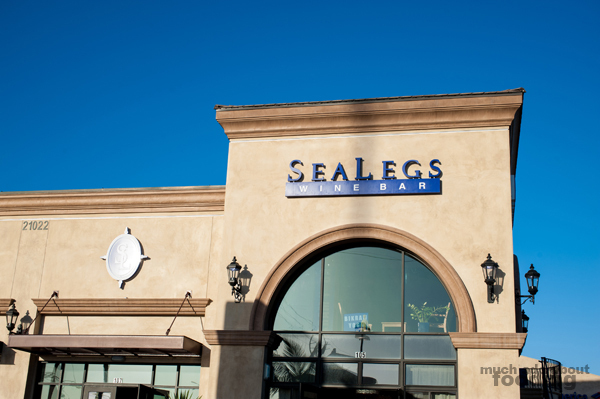 Readers, if you are interested in visiting SeaLegs Wine Bar, they are located at 21022 Beach Blvd, Huntington Beach, CA 92648. Prices listed beside the food items indicate the menu listed price as of our June 2013 visit.